Marketing communications agency announces "Super Big Non-Move"
Summertime meant big news for many downtown companies. 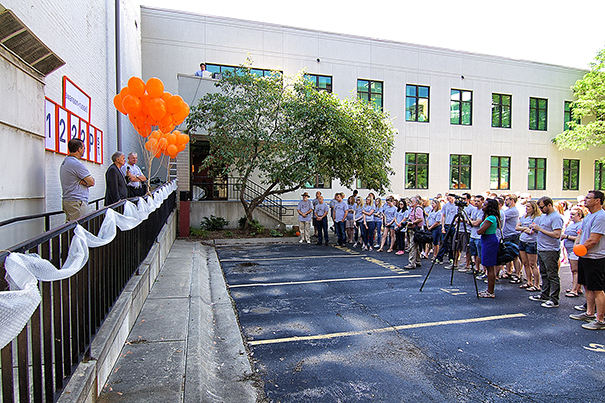 Some local businesses announced new headquarters, while new businesses introduced themselves to the community. Swanson Russell also celebrated, but for a different reason than most. The ad agency announced their “Super Big Non-Move,” an event which announced plans to expand their current location and stressed the importance of remaining in the downtown community. 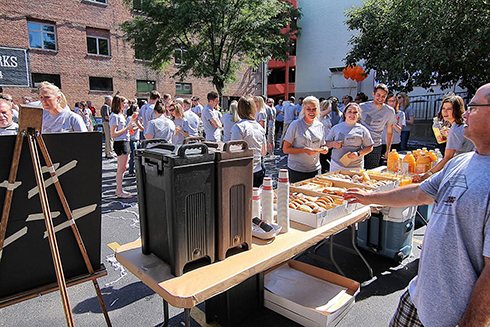 To celebrate the news, each employee received an invitation to a groundbreaking ceremony, a commemorative t-shirt and were invited to a reception on the parking lot (the future site of the addition) featuring NitroBurger, drinks and cupcakes. Mayor Chris Beutler, members of City Council and the Chamber of Commerce were also present at the groundbreaking. Since the June 19 groundbreaking ceremony, CEO and partner Dave Hansen said construction has been on schedule. He said he expects to be done with work on thefoundation and bearings in the next three to four weeks, with an overall expected completion date of May 1, 2016. Boesche said the new space will be better suited to accommodate future growth and will have room to accommodate up to 30 additional employees. In addition to the “Non-Move” event, Swanson Russell also recently celebrated winning six Tellys and four awards at the Hospital Marketing National Conference. As day-to-day business continues in the office, and although no major disruptions have taken place with major construction next door, the buzz of the future building is still felt by employees. Hansen said employees gather at the north-facing windows, interested in seeing things begin to take shape. Hansen said if people are interested, they can follow progress of the “Super Big Non-Move” at TheSuperBigNonMove.com or follow the hashtag, #TheSuperBigNonMove on social media.